Well after an almost 2 year hiatus, Around the World in 80 plates is back! Life got super busy and while this blog was always on my list of ‘things to do’, it inevitably got pushed down the priority list which was a real shame as I love doing it! But I’ve recently made some important life changes and have got a little bit more time on my hands, so I’m getting back into my passion of cooking and baking with renewed vigour. So look out in the coming weeks and months for more mouth-watering recipes and ideas for dishes from around the world, along with the back story of how that dish came about. 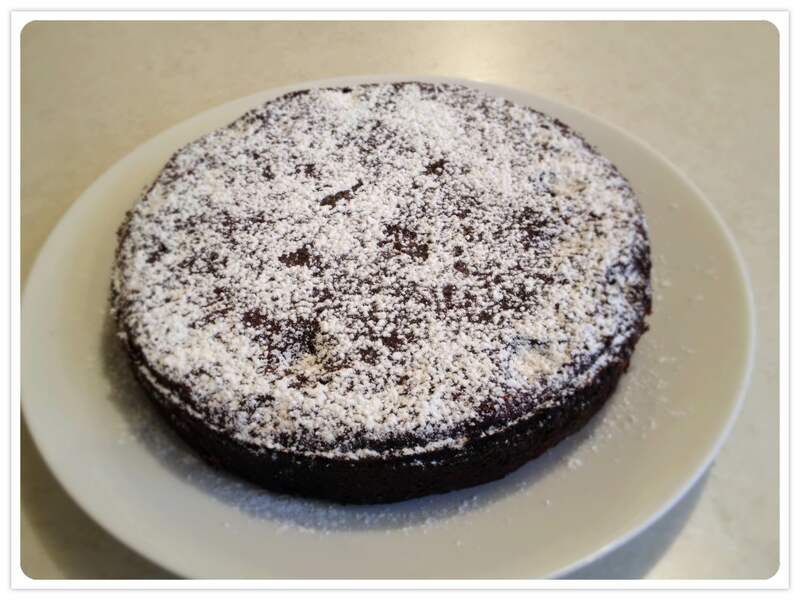 To celebrate my comeback, I created a delicious chocolate cinnamon chilli cake. This cake has quickly risen up the ranks to become one of my all time favourites. It’s relatively easy to make, tastes delicious and I’ve whipped it up for a few dinner parties now. Unfortunately I’m not sure where the original recipe came from as I got if from my lovely friend Jo, who in turn got it from a friend. Both chocolate and chilli are important elements of Mexican cuisine, dating right back to the Aztecs. They believed that cacao seeds (used in chocolate production) were the gift of Quetzalcoatl, the god of wisdom and seeds were used as a form of currency. Originally chocolate was prepared only as a drink that was believed to have aphrodisiac qualities and give the drinker strength. Chilli was also added to this drink – literally hot chocolate! This cake is a delicious example of that ancient pairing and is great any time, particularly as a great way to finish off a Mexican themed dinner. I sometimes use chilli flavoured chocolate for an extra kick as well. 1. Preheat the oven to 170 degrees celsius and grease and line the base of a 20cm cake tin. 2. Melt the butter and chocolate in a heat-proof bowl set over a pan of simmering water, stirring occasionally. Stir in the sugar and vanilla and leave to cool for 10 min. 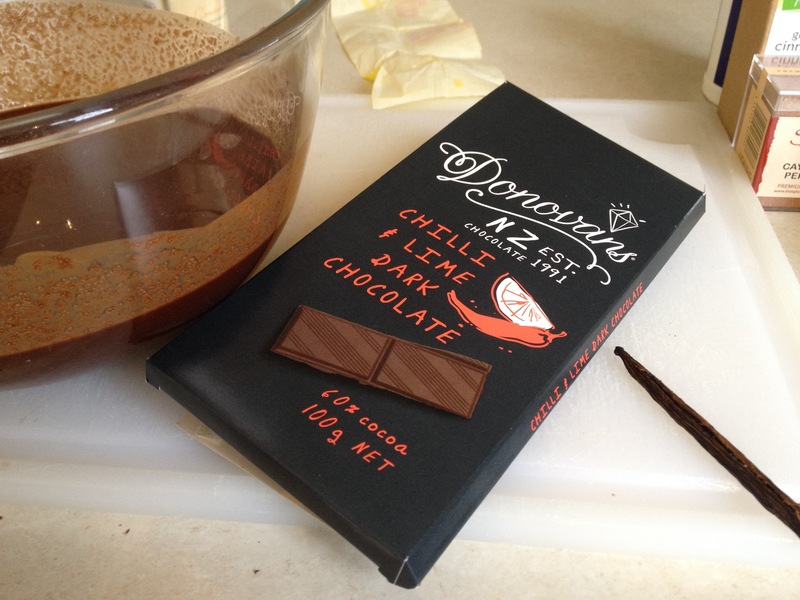 I like to use chilli flavoured chocolate for an extra kick! 3. Gradually stir in the eggs then fold in the flour, salt, cinnamon and cayenne pepper. Pour into the tin and smooth the top. 4. Bake for 20-25 min until the centre of the cake is set but not too firm. Transfer to a rack and leave to cool completely in the tin. Remove the cake from the tin and gently peel off the baking paper. Place on a serving plate and dust with the combined icing sugar, cocoa and cinnamon. Serve with the cream and candied pepitas. Whip the cream and vanilla to soft peaks. 2. Spread evenly on a lined baking tray and bake for 5-6 min turning once during cooking. The nuts will be very sticky when turning but will become crisp when cooled. Break into pieces when cold.